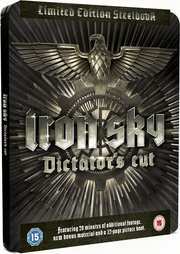 If you couldn't get enough of last year's comedy sci-fi outing, or missed out on it completely, then it looks like you have another chance in early 2014, as out on 10th February is Iron Sky: Dictator's Cut courtesy of 4Digital Media. Turning up as both a normal release and limited edition steelbook, this contains something like an extra 20 minutes of footage, behind-the-scenes featurette and 32 page booklet containing concept art if you get the expensive one. 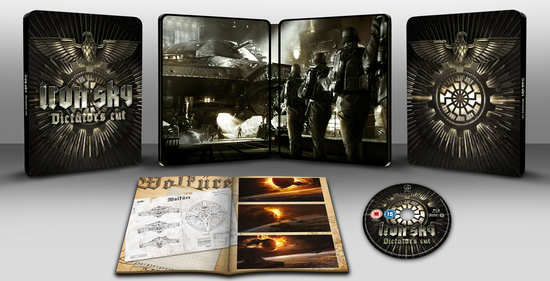 Expect a recommended retail price of around £17.99 for the Limited Edition and less for the standard release. This is directed by Timo Vuorensola, this stars Christopher Kirby, Julia Dietze, Udo Kier, Gotz Otto, Peta Sergeant and Stephanie Paul. In the last moments of World War II, a secret Nazi space programme evaded destruction by the Allies and made a daring escape to the Moon. In the intervening 70 years they have re-colonised, re-armed with devastating new weapons and silently plotted their revenge. When an American astronaut stumbles upon their secret Moon lair, the Führer (Udo Kier, Blade) decides to unleash their alien armada upon the unprepared Earth, to be led by ruthless army leader Klaus Alder (Gotz Otto). Now every man, woman and child must unite to repel the UFO Nazi invasion and save humanity! That is on the to buy list.